The first vague details on Madden NFL 17 leaked overnight and now EA Sports has followed up with some detail on what the new features will mean to the game. All three phases of football have been addressed, including long-overdue attention to special teams, new ball-carrier controls, and a new defensive AI system. The “renewed focus on Franchise mode” will be explained at a later date. We’ve added a tiered system to the types of special moves different players are able to pull off – depending on their attributes, ratings and speed. So now, expect your bigger bruising backs to be more effective with truck moves and stiff arms, while smaller, shiftier backs have more effective jukes and spins. Now don’t worry if you’re not a magician yet on the sticks. New Ball Carrier UI Prompts help teach moves available to you, while the new Path Assist helps you navigate and anticipate down field. Additionally on lower skill levels, you can put the work on us and we will pick the appropriate moves for you, unlocking the fun for all of our players. The new Defensive AI System is built on up to date NFL Strategies – such as Gap Play, Force Defenders and improved Zone Coverages. It’s time to force your opponents to stop being so one dimensional. 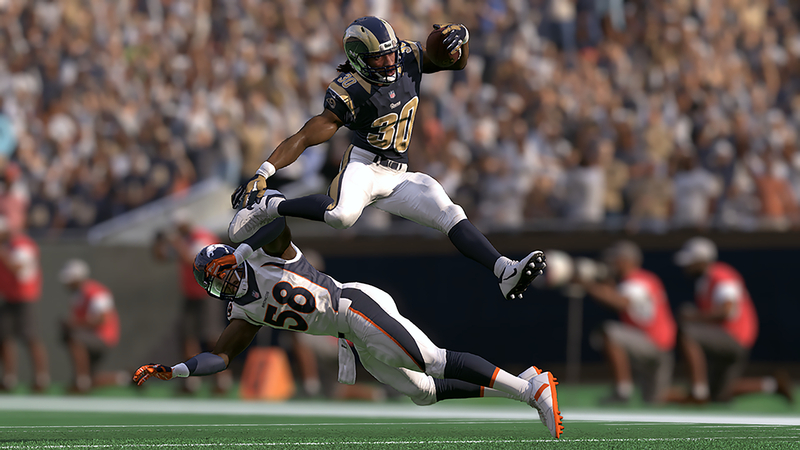 New Gap Play AI brings a new level of NFL authenticity and strategy to your defensive teammates. Each of your teammates has a gap assignment on run defense that puts them in position to better defend the run. Force defenders protect the outside of the field, pushing the ball carrier back inside allowing cut back defenders to make the big play. Finally Zone Coverage has been completely overhauled, with the addition of 8 new zone concepts never before seen in Madden. Defenders have more awareness of threats to each zone and can pattern match receivers, creating defensive counters to stop virtually every passing concept. It’s our most realistic AI to date and it’s across the entire field. Special Teams, the 3rd phase of football, is where big games are often won and lost. For the first time years we’re bringing the excitement back to special teams. A New Kick Meter is designed to increase the challenge of the kicking game like we see in today’s NFL. Additionally, the ability to ice the kicker allows you to turn up the pressure on those late game winning field goal attempts. New trick plays and a new block kick mechanic add new elements to the risk and reward of Special Teams. Madden NFL 17 releases on August 23 for Xbox One, PlayStation 4, PlayStation 3, and Xbox 360. The game is now available for pre-order on Amazon where it is 20% off ($48 for standard or $64 for Deluxe) for Prime members.